You can order all your components online from aliexpress, hub360, or ebay . To get the inventone board, click this order link. L298N bridge breakout board allows us to control two dc motors at the same time, it also gives us the ability to choose what direction we want our motors to turn. 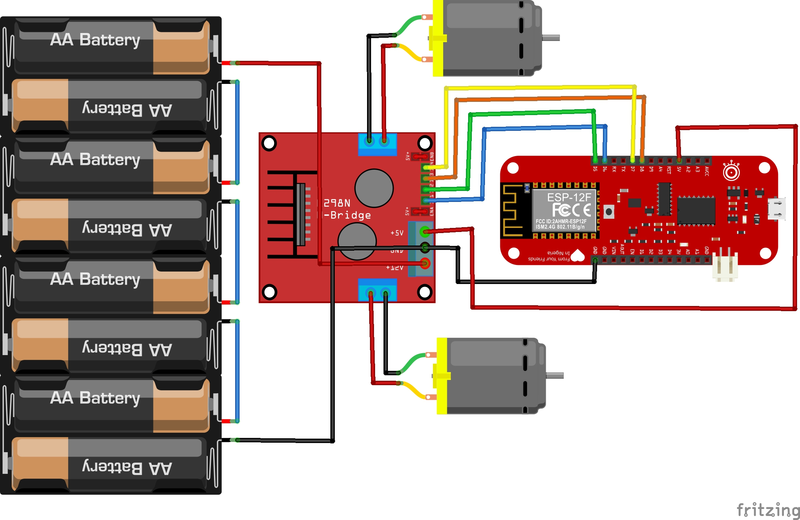 For more info about the L298N bridge see this tutorial: Arduino DC Motor Control Tutorial. We’ve added a picture of the circuit connection which we designed using fritzing, while implementing this project we used three lithium 3.7V batteries to provide longer power. The connection below would suffice but for better performance we suggest you get lithium batteries and connect them in series. Note also that the L298N Bridge requires a minimum of 12V as power, and you need to connect the enable pin to about 5V for the L298N to respond to the signals sent from the inventone board. Just make sure you go through the tutorial above to get more understanding of the L298N bridge. Implement the circuit above taking note of the pin numbers, you can also get the 5V required to power your inventone board from the L298N bridge board. Don&apos;t forget to connect the ground from the bridge to the inventone board. Basically, we have four output pins which we would be using to drive the dc motors. We would be creating two demos; DemoOne drives the two rotors for 2 seconds by writing a high voltage level on one of the legs of each rotor and then a low to the other leg. Next we turn of the motors for half a second, finally we drive the motors in the other direction by changing the polarities of the voltage in which we write to the motors. Demotwo does about the same thing except that we have a for loop which we would be using to increase or decrease the speed of the motors gradually from zero to its maximum speed and from its max speed back to zero. Finally, in the loop we would run each of the demos for about 1 second.